Tecnicos took 2/3, when Sagrada faked a foul. 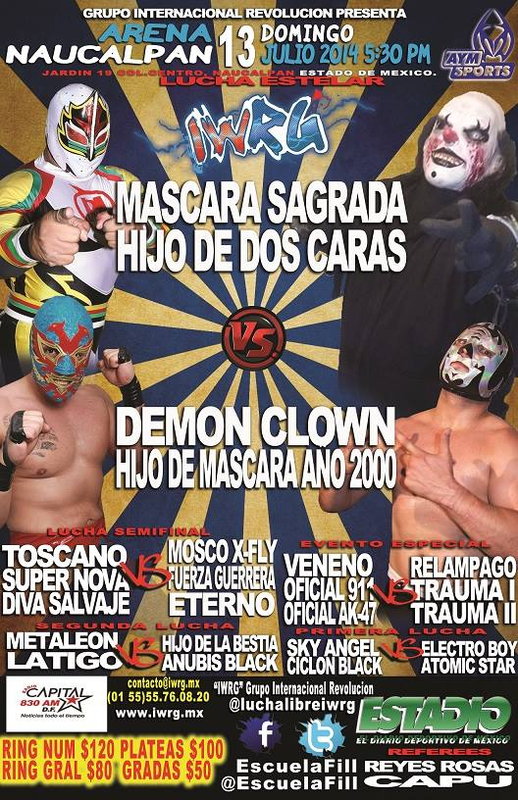 Hijo de Mascara Ano 2000's third defense. 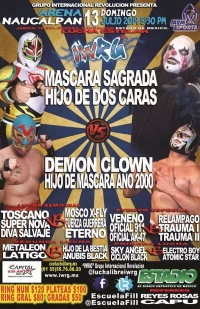 Demon Clown hit Hijo de Dos with a chair at one point, and Mascara retained with a backcracker. main show debuts for the Payasos, who promptly lost in straight falls. Tecnicos took 2/3. Dibalo fouled Golden Magic in the third, which went undetected by one referee but was belatedly caught by the other. Apolo ran in and fouled Veneno, but again a ref figured it out after the fact. Latigo replaced Ciclon Black. Straight falls. Oficials took falls 1, Traumas took fall 2. Those two teams brawled outside while Veneno went for the top rope senton on Relampago. Relampago moved and won with a splash. Veneno and Relampago shook hands after the match, while the Traumas demanded a title match with the Oficials. Rudos took 1/3, with Eterno (already eliminated) using a ref distraction to knock Toscano off the top rope and X-Fly pinning Toscano while using the ropes. Universo 2000 Jr. appeared before the match, threatening to debut soon. 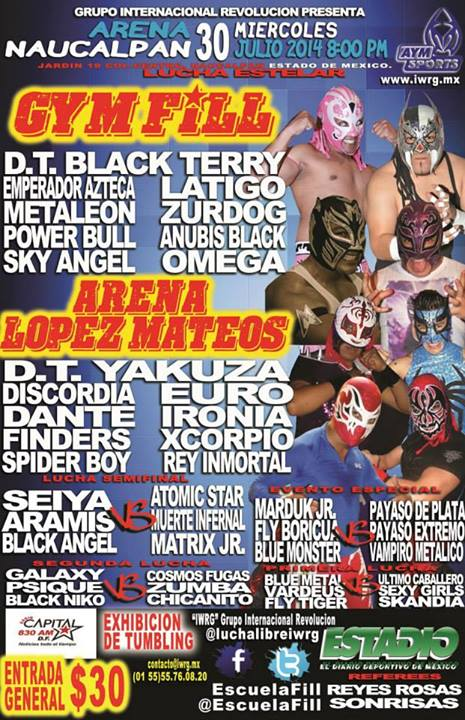 Tecnicos took fall 1, Universo helped the rudos take fall 2. Sagrada caught famed Canadian Demon Clown in a tirabuzon, M2K tried to break it up with a chair, Dos took the chair away but accidentally smacked Sagrada with it. Rudos got the win. Dos insisted it was a mistake but Sagrada said this was the start of a rivalry. 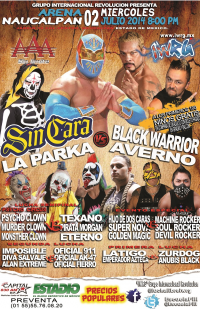 Rudos took straight falls, Eterno faked a foul for a DQ. 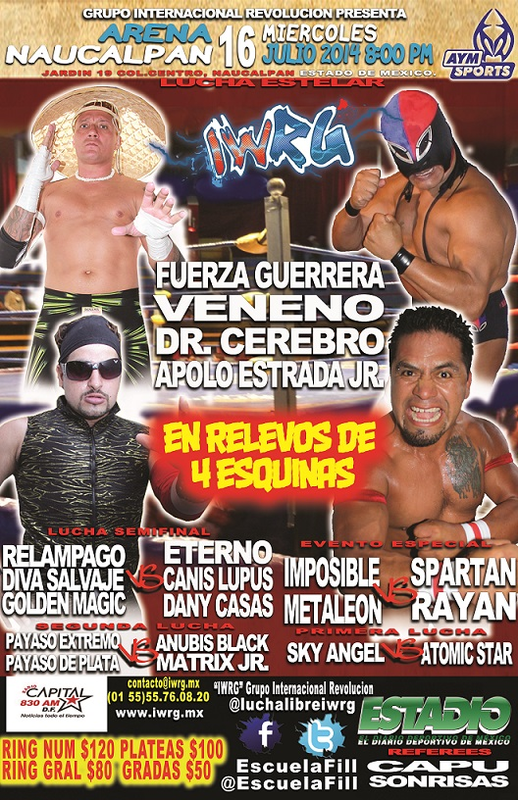 5) Dr. Cerebro b Fuerza Guerrera, Veneno, Apolo Estrada Jr.
Eliminations went Fuerza (Veneno), Veneno (Apolo) and Apolo (Cerebro). Alan Extreme challenged Guerrero Mixtico a hair match, but Guerrero declared Alan wasn't near his level. 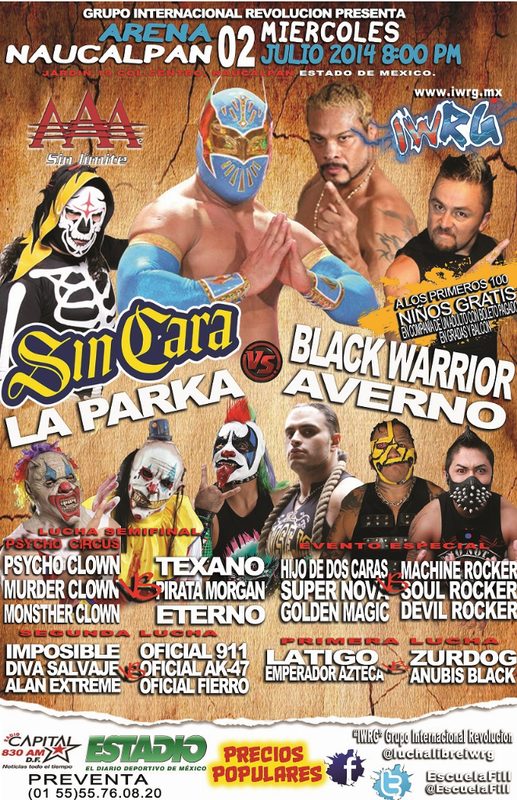 Tecnicos lost, challenged for a (Mexico State) trios title shot and the Gringos accepted. Rey Horuz looked good in his debut. 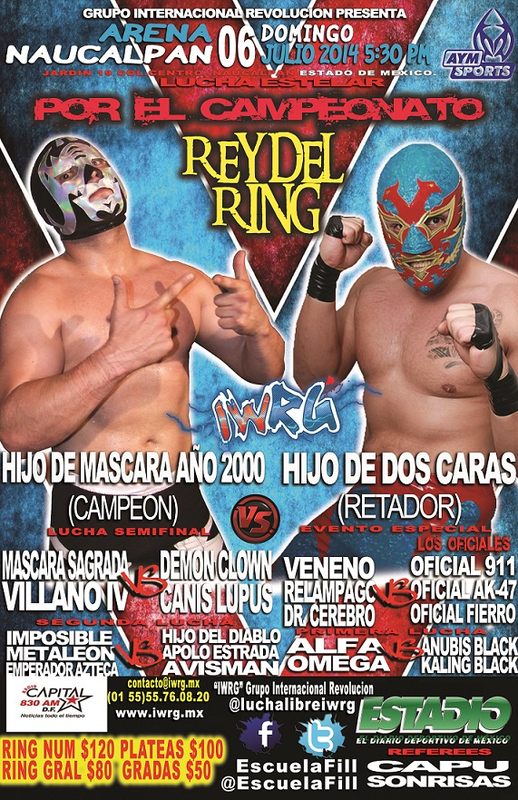 Probably first ever IWRG ladder match for the vacant championship. (Vampiro last won the title and immediately retired.) They broke the only two ladders which could be used to climb to get the belts. 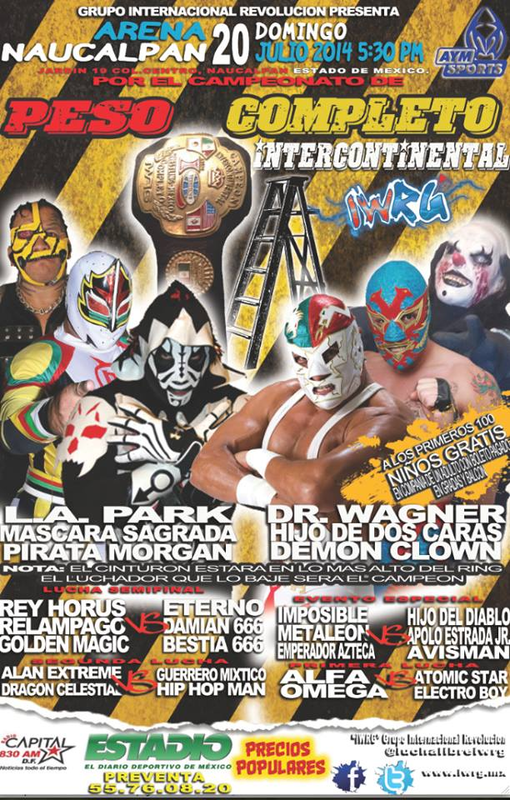 They found a third ladder, the kind you lean against a wall, and Pirata Morgan and two referees held the ladder up so Hijo de Dos could climb it. Dos couldn't get the belt untied from the rope for a long time, but was eventually declared the champion. Match sounds like a disaster, Tercera Caida called it a match with a lot of errors. First Gaviota match here since March. Rudos took 2/3. Veneno accidentally fouled a referee, got the three count over Mascara, then it was a DQ anyway. 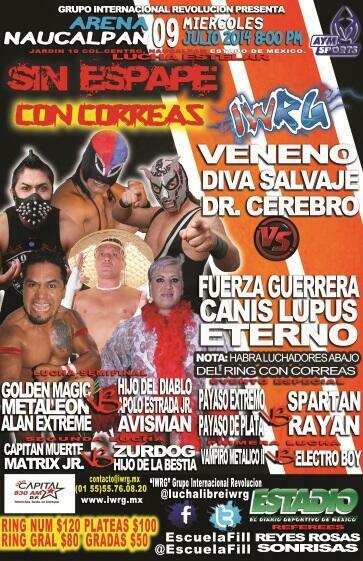 Rudos took 1/3, Guerrero Mixtico beat Alan again. Oficials jumped the Traumas with chairs, but the Traumas rallied to take the match in straight falls. Mask ripping and blood. AK-47 tried to use a bottle at the end, but it backfired with Trauma II smacking him. 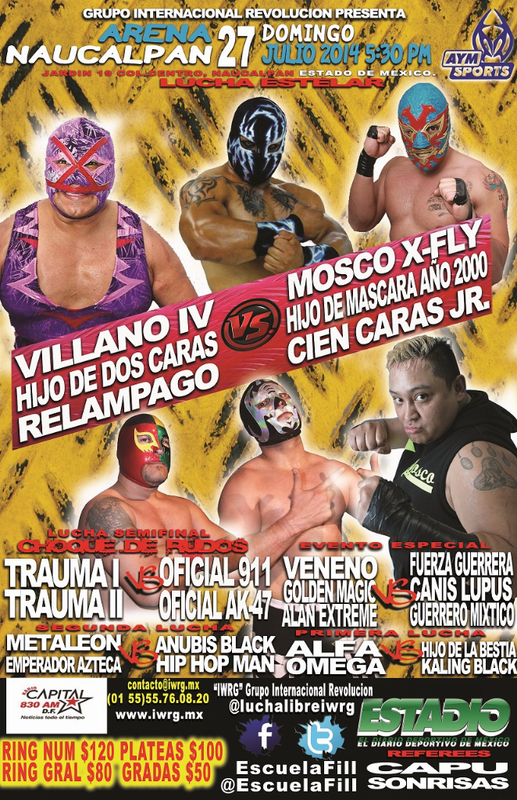 Rudos took 1/3, Mascara sneaking in a foul on new champ Dos and X-Fly covering for the win. 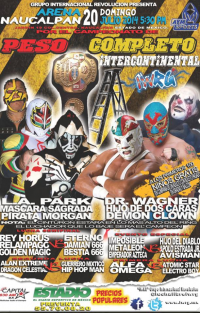 3) Payaso De Plata, Payaso Extremo, Vampiro Metálico b Blue Monsther, Fly Boricua, Marduk Jr.
IWRG vs Arena Lopez Mateos (Yakuza). Match came down to Metaleon versus Spider Boy. Metaleon took out Spider Boy with a dive, but Yakuza hit him with a chair while he was out there. A groggy Metaleon returned to the ring and was beaten by Spider Boy for the win.